Oh my goodness, this thing has gotten my interest! 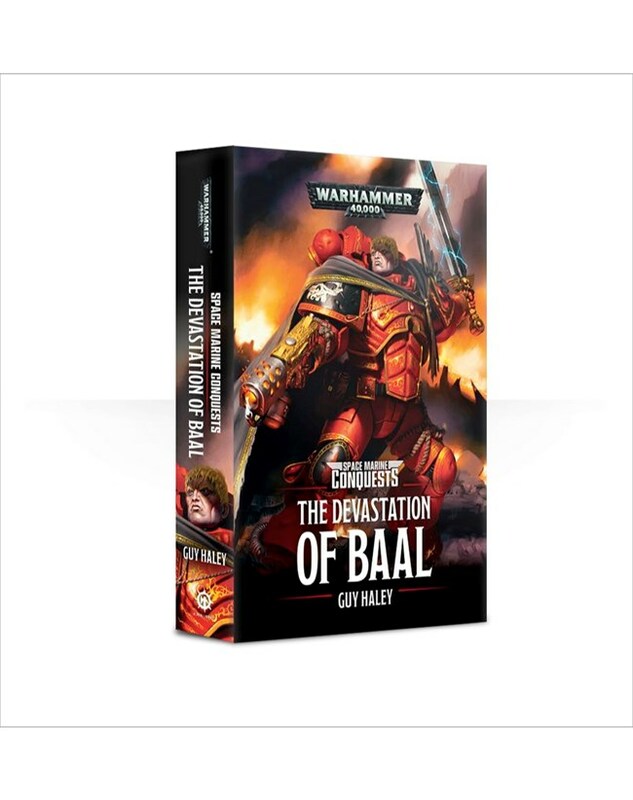 The Devastation of Baal looks like it should be a really good book. Guy Haley does churn out some great fiction, of course, and I’m really keen to see how the new 8th Edition timeline is going to progress, so I’m looking forward to getting this next month! I’m not the biggest Blood Angels fan, of course, but I did really enjoy the Shield of Baal series back in 2014/15, so if it gives off this kind of vibe, then I’m all for it! Also – Space Marine Conquests? Is this another series of Space Marine-centric novels? If they have similarly amazing stories as the Devastation of Baal seems to be, then I’m all for it! 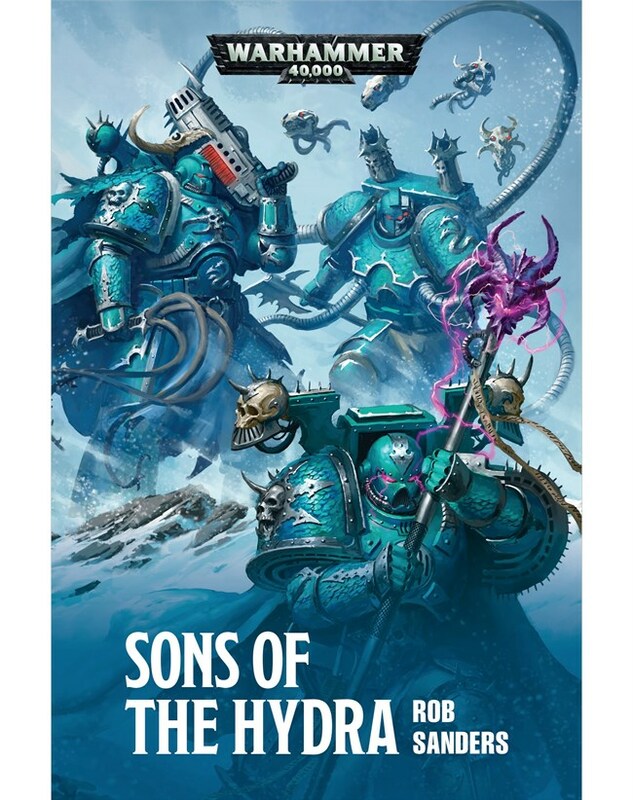 Sons of the Hydra, coming in January, sounds like it could be a really interesting book. An Alpha Legion soldier seeking redemption for his legion? I’m more intrigued than I can possibly say! Of course, I have an Alpha Legion army that is still something of a work in progress, and definitely hold a soft spot for the duplicitous sons of Alpharius. It’s one of the things that’s interesting me so much about Deliverance Lost right now. There are still plenty of new books (and some not-so-new!) that I want to get round to, mainly that I’m waiting to arrive in paperback, top of that list being Ghost Warrior and Shroud of Night. It’s going to be a very busy winter! While I’ve been reading (and re-reading) all manner of stuff at the minute, I thought I’d talk today about a book that I read a few weeks ago, back when I was moving house and all that attendant nonsense. 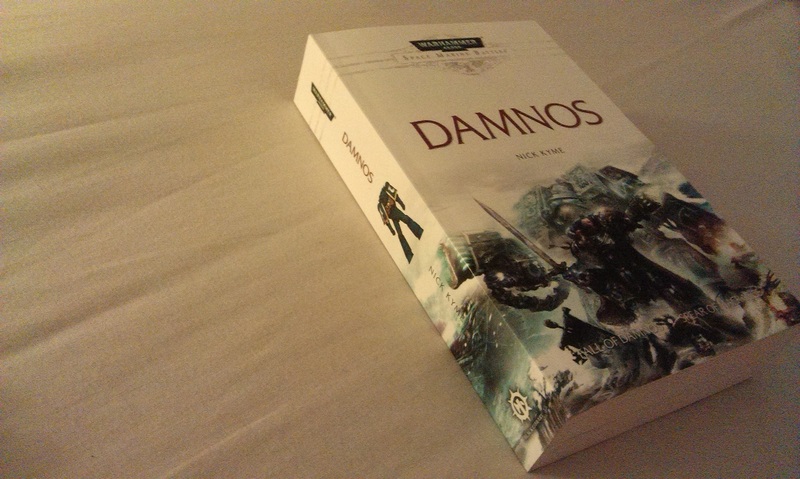 The Fall of Damnos is the main bulk of the Space Marines Battles: Damnos book, which follows the progress of the Ultramarines’ attempt to liberate the populace of the mining world of Damnos from the return of the Necrons. To all intents and purposes, I should love this book. Indeed, I’ve thought of it for a long time now as the quintessential Necrons novel. Confusingly, one battle group of Ultramarines is referred to as the Immortals, which is around the same time we get the Necron Immortals entering the fray. Kyme even uses different words to describe these guys depending on the point of view – to the Ultramarines, they’re “larger warrior constructs” or something, whereas to the Necrons, they are of course Immortals. Necron Raiders are mentioned quite a lot, often in relation to what I assume otherwise to be Necron Warriors. While the use of Raiders might be a nice throwback to fans of 2nd Edition, I can’t say it held much appeal as a Necron fan. Indeed, there isn’t really much here for fans of the undead space robots. There’s a mad Overlord, a scheming Cryptek, and the usual insane Flayed Ones, then the most part of the army consists of Warriors/Raiders, and Canoptek Scarabs. Monoliths make an appearance at one point, which is nice, and there may have been a Tomb Stalker mentioned for one incredibly brief moment, but otherwise it’s quite a one-dimensional foe for the brilliant Ultramarines to fight. As for the Ultramarines themselves, they’re a weird mix of politicking folks who seem to be out for personal glory above all else. Weird, right? Damnos dates from 2011, and feels very much like “the old” Black Library. Sure, they still put out clunkers and filler-type novels, but in the main, they definitely feel like they’ve upped their game since these days, where they were basically a game company tie-in. We may not be getting Shakespeare now, of course, but we’re getting novels that are actually enjoyable to read, and are worth reading for their own merits, and not merely because they describe the deeds of the plastic men we push around on the tabletop. The Necron lore in particular felt badly written in this one, which put me off it pretty much entirely, but even with that aside, I can’t think of any reason why you’d want to pick this one up today. Well folks, I made it! It’s been a little over five months since I started reading The Beast Arises series from Black Library, and I’ve finally made it through to the end of the twelve book series at the weekend. I want to take a look first at the final installment, before putting down some rambling thoughts on the series as a whole for you all to enjoy, so sit back and see what I’ve made of it all! I said in my blog on the previous novel, Shadow of Ullanor, that the series felt done right there, and I was a bit curious as to why we needed a twelfth book when the saga of the War of the Beast had pretty much been wrapped up, but The Beheading deals with the political fallout of the war, and in that respect, it is very much required reading. We start with the return of Maximus Thane to Terra, where he takes up the position of Lord Commander at the political manoeuvring of Vangorich, however the space marine has no intention of remaining on Terra, and appoints the Grand Master of the Assassinorum as his regent. Vangorich, despite his protestations of wishing to remain behind the scenes, promptly goes about removing all of the High Lords and replacing them with his own puppets, which forms the main portion of this book – and, indeed, the ‘beheading’ of the title. With little check on his power, Vangorich goes insane and, after a century of despotism, Thane returns to put an end to the assassin’s rule. Of course, coming at the end of a twelve-book series, there is rather a lot going on in the middle of all this, and we get closure on pretty much all of the plot threads, so far as I could see. Firstly, the Fists Exemplar/Iron Warriors storyline is resolved in fairly explosive fashion, with Zerberyn joining forces fully with Kalkator, and leading to the removal of the Fists Exemplar Chapter from the records of the Imperium. I was not actually expecting the story to turn out that way, and was actually in open-mouthed horror when I read it, which I suppose is the mark of a well-written plot! Another plot twist concerns the death of Inquisitor Veritus, and the reveal of his real identity. I don’t want to spoil it here (despite spoiling pretty much everything else!) but it was nicely done, and I suppose not entirely far-fetched. I did like the fact that we get to see the Grey Knights at last, but I thought it was a bit weird how the final chapter forms a quite abrupt jump in the narrative, as we move from Titan to a century later. Discussing it at my local store, a lot of folks think it leaves the door open for more story later on, which I suppose makes sense, though Black Library did market this as a self-contained series that would be told in twelve books and that would be all. Hm. There have been many cinematic moments throughout the series, such as the pursuit of the Harlequins through the palace at the start of Guy Haley’s previous entry Throneworld, to the co-ordinated assaults of the Deathwatch in The Last Son of Dorn, and to those can be added the central episode of this novel, the assassinations of the High Lords. I also think the confrontation between Zerberyn, Bohemond and Kalkator, and that scene’s terrible conclusion, is one of the highest points of drama I’ve read in a 40k novel so far. It unfolds over only a handful of pages, but that tension becomes almost unbearable – I only hope we get something comparable when the Horus Heresy series concludes. At any rate, the book was a decent end to the series. The series as a whole, then, was pretty uneven. To start with, I think there were some bad editing choices – I’ve mentioned it before, but it seems like there’s some kind of rule that these books absolutely could not be more than 250 pages in length, which led to some instances (such as the aforementioned leap of a century) that felt oddly disjointed. Even those books that weren’t nearing the limit felt like they could have had some more material to help them along a bit. Watchers in Death in particular felt a bit weird towards the end there. However, I also feel that the series as a whole was oddly padded sometimes. I’ve made no secret of the fact I really disliked the second book, but throughout the series there have been instances where it felt a little like the story was being dragged out. I think it’s entirely possible that the original plot line for this could have been ten novels at most, and someone then decided to drag it out over twelve to do the one-a-month release thing. I’ve read that the Black Library have had the series in their vaults for years, which I do entirely believe – I mean, how else could they get these books released on time like that? But it does kinda sadden me when little inconsistencies, and extended sequences of padding slip into the narrative. All of that said, I thought the overall story was pretty decent, more for what we learnt along the way than anything else. It annoyed me that we never really get an explanation for why the Orks are so technologically advanced here, whereas everywhere else they’re described with something akin to madness in their engineering. They can launch co-ordinated assaults across the galaxy, using teleportation technology that the Mechanicus cannot quite get the hang of? What caused this development? How did the Orks manage to get such huge numbers when the Imperium thought they had been crushed at (pre-Heresy) Ullanor? There were a lot of unanswered questions about the Beast, for me, and it really irked me as the series went on that we never get the Orks’ perspective. Sure, I should have expected it, but there was just too much missing for me to adequately maintain my interest over the series. The closest we ever came was Beast Krule’s infiltration of Gorkogrod, but one moment of insight across a twelve novel series does not really make up for it, in my view! What I found interesting here, though, was the way that several important elements of the 40k lore were bound together into the narrative, which really seemed to lead to the sense of this series being an Event. For years now, fans have known that the Imperial Fists were almost decimated to a man and had to be rebuilt from successor chapters; we’ve known about the shadowy beginnings of the Deathwatch and the Grey Knights, and all the rest of it. Something I hadn’t actually realised was that we’ve even known Vangorich would eliminate the High Lords of Terra in an event known as The Beheading! Shows how much I’ve read those timelines of events in the rulebook!! All of these strands are brought together into one narrative and, despite all of the criticisms that I’ve just leveled at the series, I’ve actually really enjoyed seeing them all come together in one place! Along the way, we get some really compelling characters. I was always surprised by the choice of Koorland as something of the central character, as he was never someone I had pegged as all that interesting. But then, I suppose that’s part of the problem with space marines – while the Horus Heresy has done great things to show us some very interesting sides to the superhuman warriors, they are a bit boring. Put them among the political shenanigans of the Council of Terra, and they come off even worse. But even so, I was surprised at how much I warmed to him as the figurehead of the series, and was shocked to see him go. Thane, who takes over the mantle, always seemed even less interesting than Koorland, but I do like how strident he could be. While Zerberyn and Kalkator are hardly going to feature very prominently in any top ten space marine characters list, I was nevertheless totally sucked into that storyline, and found myself missing it when neither appeared. Worried about how it would be concluded, I was pleased to see it take a suitably dramatic turn at the end. There are so many shades of grey in the Imperium, I thought it was really interesting to explore this post-Heresy brother against brother kind of tale. Over time, I also found myself enjoying the Mechanicus side of the storyline. We never truly know what’s going on with the Lords of Mars, of course, but even so, I enjoyed some of these scenes much more than I’ve previously enjoyed any story featuring them (Mechanicum, for a start), and have even found myself looking into collecting some Skitarii! Inevitably, I found myself most enjoying the scenes that showed the Inquisition and Vangorich. I’m a huge sucker for political skulduggery, so this should’t come as a surprise to anyone, but I vastly preferred to read about the machinations of the High Lords to any extended battle sequences. Wienand really interested me at first, while Veritus annoyed me to hell with his zealotry, but I think, having now read who he really is, it makes a lot more sense. This, however, brings me back to what I’ve said earlier, the series is just too over-long for my tastes. I think showing three attacks on Ullanor really goes to show this point, but the fact that we have some mysteries that are dragged out, and some that we didn’t even know about until the end, it just feels like this series has outstayed its welcome. I’m glad I made it to the end, and I’m glad I’ve read it for its impact on the lore of the 40k universe, and while I’d recommend it to anyone who likes 40k for that reason alone, I don’t think I’ll ever bother reading it again. Let’s end with some favourites, though! How about you? Have you made it to the end? Let me know what you thought of the series in the comments! The twelfth and final book in The Beast Arises series is available on Saturday, but I’m only now a third of the way through, having this morning finished reading the fourth in the series, The Last Wall! Like previous installments, this book picks up directly after the last one, with the Ork battle moon in orbit over Terra. Initially in panic, the High Lords of Terra unite behind the plan put forth by Juskina Tull, speaker for the Chartist Captains, to basically throw as many bodies at the Orks as possible. The Proletarian Crusade is born, and amid a smattering of Astra Militarum platoons, millions of civilians enlist to go up against the greenskins. Meanwhile, the Inquisition intrigue continues, as Wienand reaches the polar fortress of her order and, despite Veritus having effectively replaced her on the Council, seemingly manages to convince her colleagues that she hasn’t lost sight of the threat of Chaos, merely that the Ork threat is more immediate and must be tackled now. Some disturbing news reaches her there, however, that Ork activity around the Eye of Terror may be causing a Chaos incursion. The Crusade doesn’t end well at all, which is somewhat to be expected, and three Ork “ambassadors” arrive at the Imperial Palace, demanding humanity’s surrender. When the High Lords refuse this, the Orks leave, condemning the population of Terra, however a massive detonation signals the arrival of yet another xenos threat: from the Eldar! This book was actually pretty great! I enjoyed seeing the continued intrigue among the Inquisition, and while the overall politics among the High Lords still doesn’t seem to be going anywhere, it was nevertheless interesting to read and immerse myself in. Something that I particularly enjoyed was seeing actual Ork characters finally in the series – we’ve been three (and a half!) books now with the story only being told from one side, and while I don’t think we’re really any further forward in knowing why the Orks are suddenly attacking humanity on all fronts, the intrigue has been dialed up a notch in that the Ork ambassadors appear unlike any greenskin yet seen in the Imperium. Coupled with the ongoing investigations of the Mechanicum that keep getting hinted at, this is slowly proving to be an interesting aspect of the series. 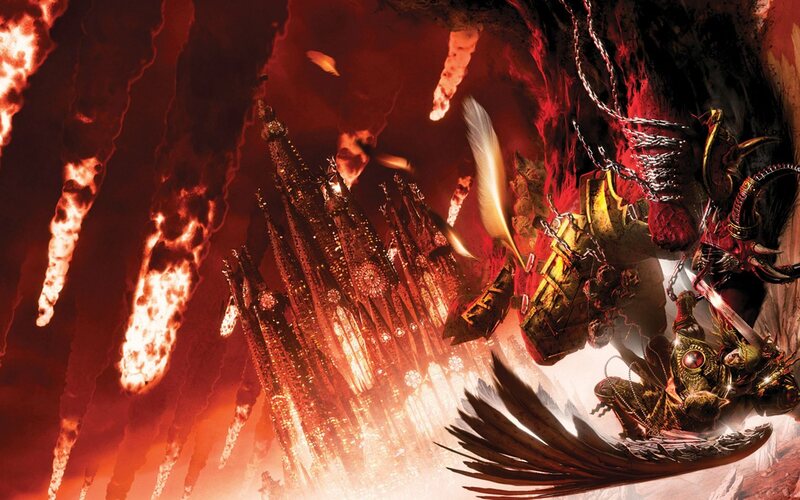 I felt a bit cheated that the story didn’t involve the astartes more heavily – the book is called The Last Wall, which we know is the failsafe from Rogal Dorn to reunite the various chapters back into the Imperial Fists Legion should the need arise. Yet we only get (I think) one chapter that dealt with this! It seems like maybe a wrong choice for a novel title, though I admit that the Proletarian Crusade was referred to as a last wall also. Hm. I get the impression, from a lot of these vignettes, that the authors are trying to develop the setting for perhaps some more stories later on – whether around the same timeframe, or else in subsequent years. So we’re seeing a lot of things just for the sake of establishing that setting, rather than having any meaningful part of the actual story. I could be wrong, of course, but it’s just the sense of having things sketched in and whatnot. Maybe the much-anticipated 8th edition Warhammer 40k will have options for historical narrative play or something? Who knows! At any rate, I thought this was a really enjoyable book, and one that I found myself engaged with more so than some of the previous books. With the threat of the Eldar poised to further complicate the issue, I’m going to move on directly to Throneworld now, anyway, so watch out for the next book shortly!